I love Halloween and believe if the occasion allows dressing up, well then by all means dress up. 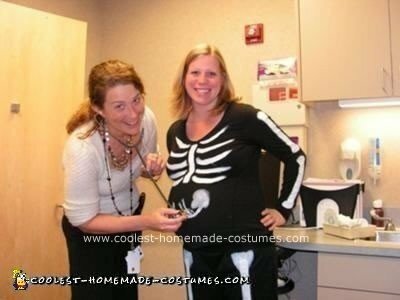 I wore this Pregnant Skeleton Costume Idea to work for our Halloween party and received 1st place then to my doctor’s appointment and everyone loved it, I even got a photo with my doctor checking the “baby’s heart beat” and then to the bar with my friends later and received first place there! I made the pants and bought a cheap shirt and wore my Bella band to make up the difference in the middle. My sisters then painted bones on my outfit with white paint while I wore it to make sure we got the bones in the right place. The paint soaked through but I took the outfit off before the paint dried too much and just scrubbed it off my body later. I also had black gloves that they painted too. For the bars my sister painted my face too. It was a big hit and everyone really seemed to like our creativity! My daughter is nearly 6 months preg and has a few costume contests coming up so we were looking for something “different”…we found it!!! Thanks soooo much for sharing!!! She will surely be a hit with this one, cant wait to put it together!!! 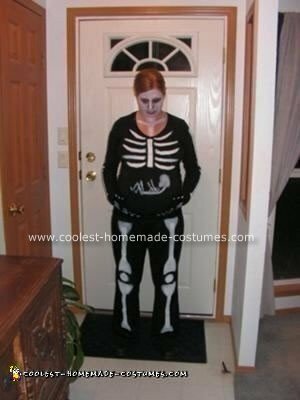 I’m 7 mos pregnant and will be a pregnant skeleton for Halloween this year. i loved this idea and used your pics to help create mine! i also made one for my husband but with pizza in his belly! people loved it!